Unique Experiences In Mumbai You Should Be Signing Up For Right Now! For many, Mumbai might be the city of only Bollywood lovers, but it also has a host of experiences for all types of people. And this time around, we are putting together a list of unique experiences, that are true #bucketlistgoals. How many have you experienced so far? Ditch the traffic in Mumbai and witness the city from 1,000 feet above the ground. Hover above the Mumbai skyline in a Cessna C-172, and find out if you truly know the city well by spotting iconic locations. The panoramic view of Mumbai will surely leave you wanting for more. #LBBTip: Book your ticket for the joyride from jetprivilege.com at INR 7,274 and earn 880 JPMiles. After experiencing the skies, it’s only fitting that you take on the sea. Sign-up for a Sailing experience and learn to steer under a guidance of an instructor. Not only is it a great sport but also a way to escape the hustle-bustle of the city life. #LBBTip: Book your spot from jetprivilege.com at INR 9,000 and earn 1,080 JPMiles. We have all dreamt of flying an aircraft or have wondered, at least, what happens inside the cockpit of a jet. 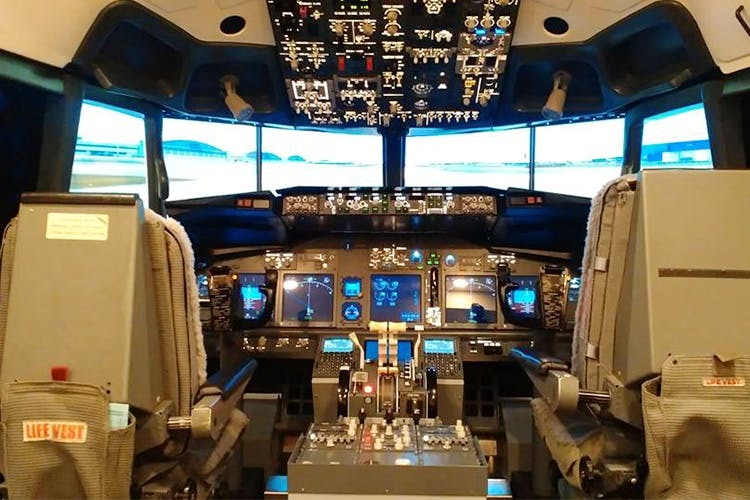 Well, now you can stop dreaming and actually learn to fly the Boeing 737, at Flight simulation centre, run by Flight For Fantasy at Kurla. You can choose from over 20,000 airports from all over the world to take-off and land, fly in different weather conditions, all under the guidance of a trained instructor. #LBBTip: Book your session from jetprivilege.com at INR 1,250 per person and earn 210 JPMiles as well. For all you wine lovers, Fratelli Vineyard offers an exclusive tour of their facility where you learn about different varieties of grapes, partake in wine tasting, and enjoy an ATV ride at Motewadi. If you are planning a weekend getaway, don’t look any further. #LBBTip: Book your tour from jetprivilege.com at INR 7,475 and earn 785 JPMiles per couple. PS: Here’s a little hack to make your experience more rewarding. Club your various transactions by using the JetPrivilege or Jet Airways co-brand card and your JPMiles earnings will be accelerated. These accumulated JPMiles can then be used to get you free flight tickets and cabin upgrades! You can also transfer or gift miles to your loved ones or use them to buy products from the JetPrivilege reward store. Sounds awesome, right? If you are not a JetPrivilege member, enrol now by visiting jetprivilege.com to explore the various benefits and privileges of the programme. This story is in partnership with JetPrivilege.